Sometimes, trying to save a few pennies can have costly consequences. This was the lesson learned by one mine in West Virginia during a routine inspection by MSHA. When auditing mine documents, the MSHA inspector noted that Spraying Systems Co.’s BD hollow cone spray nozzles were specified for dust knockdown around continuous miners. But when inspecting the spray system, the inspector discovered another manufacturer’s spray nozzles were being used and noted the violation. The mine superintendent tried to make the case that the performance of the spray nozzles in use was identical to the performance of Spraying Systems Co.’s BD spray nozzles. He said the other spray nozzle manufacturer provided documentation stating their spray nozzles provided the exact same performance as Spraying Systems Co.’s BD spray nozzles and could be used to replace BD spray nozzles. Whether or not performance was identical wasn’t the issue, however. The mine was not in compliance with its written safety plan and would be fined thousands if the violation was not resolved in the timeframe specified by MSHA. The mine superintendent quickly placed an order for BD spray nozzles and installed them. He also contacted the manufacturer of the “replacement” spray nozzles and complained. The manufacturer then contacted MSHA questioning why the substitution of one brand of spray nozzle for another wasn’t acceptable given the comparable performance. MSHA has already decided to research the issue and shared its findings with the manufacturer. A review of the manufacturer’s published performance data confirmed that the spray nozzles performance should be identical. However, side-by-side flow testing revealed some dramatic differences. - Two sizes of spray nozzles were tested. The flow rates of the two spray nozzles in the first size tested were comparable. - During the next test using the second size, Spraying Systems Co.’s BD spray nozzle performed as expected and matched the published data. The spray nozzle from the other manufacturer sprayed 24% under its rated capacity at the first pressure tested. As the pressure increased, the flow rate problem increased. - When the spray nozzles were spraying side-by-side, it was easy to see differences in the spray patterns. 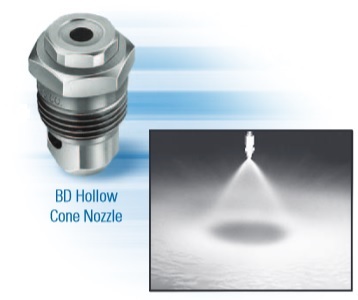 The BD nozzle spray pattern was uniform and consistent. The spray nozzle from the other manufacturer produced a pulsating, inconsistent spray pattern. Just because precision components look identical and the performance claims are similar, don’t accept the information at face value especially if there is a price differential between the components. In the case of spray nozzles, monitor flow meter readings or collect and measure the spray from the nozzle for a given period of time at a specific pressure. Then, compare the readings to the flow rates listed in the manufacturer’s catalog. You can also visually inspect the performance of the spray nozzles by spraying side-by-side. If the sprays look different, the performance is different too. Will a change violate your written safety plan? Can you confirm the alternative nozzle actually delivers the promised performance? Is the small savings you may experience on nozzle purchases worth the time and effort required to make the change? Spraying Systems Co. is global leader in spray technology. It has the broadest product range in the industry, ten manufacturing facilities and sales offices in more than 85 countries. Spray nozzles, turnkey spray systems, custom fabrication and research/testing services comprise the 76-year-old company’s offering. More information is available at www.spray-nozzles.co.za by contacting the company directly at 011 618 3860 or by email grant@spray.co.za.